Ennis-Brown House today, in dire need of repair. Title: Charles Ennis Residence, Los Angeles Circa 1940s-50s (1923 - S.217). Description: Set of 10 - 35mm slides of Ennis Residence. These slides appear to be taken near the end of construction. Windows and curtains appear to be installed, but raw dirt still covers hillside, and foundation has not been covered in front of Dining Room. Exterior chain link fence enclosing the property has been installed, construction material is still scattered around the landscape. Photographs published in the November 1928 issue of Creative Art shows hillside and built-in planters in front of Dining Room covered in foliage. There is only one hitch in dating these images circa 1924-1925. In image number 7, there are trees on the 20-30 year old fir trees on the east slope of the property. "Wright In Hollywood" Sweeney, 1994, p.88, show a photograph circa 1924-25, of that same view under construction. There are no trees in that spot. 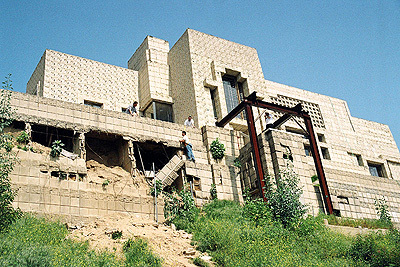 Frank Lloyd Wright designed the Ennis House in 1923, the chauffeur�s apartment was completed in December 1924, the house was completed in August 1925, but the interior was not completed until September 1926. Charles Ennis died in 1926. His wife Mabel lived in the house until 1936. The house passed through several owners. John Nesbitt, owned the house from 1940 to 1942. He made alterations to the home including a swimming pool and billiards room. In 1968 August (Gus) Brown and his wife became the eighth owners until 1980. Circa 1940s-50s. Most likely photographed during one of the renovations between 1940 to 1968. Not dated. These slides were purchased from an estate sale with slides from the 1940s and 1950s. They are in color, but the color balance is so off that we have reduced them to B&W. Size: Set of 10 - 35mm color slides and high-res B&W images. Title: 1) Charles Ennis Residence, Los Angeles Circa 1940s-50s (1923 - S.217). Description: Viewed from the Southwest. Vegetation and landscaping is missing. Dirt in front of the South Elevation appears to a work in progress. Some blocks in the walls in front of the Living Room are missing. Most likely photographed during one of the renovations between 1940 to 1968. Stamped on face: "0." Verso: "Processed by Color Photo, Inc. Ektachrome Transparency." Not dated. Title: 2) Charles Ennis Residence, Los Angeles Circa 1940s-50s (1923 - S.217). Description: Viewed from the Southwest. The Entry Court is on the far left. The Guest Bedroom is on the left, the Dining Room is to the right, with its large window and below, a set of doors that open out to a small separate terrace that reaches the furthest South. The Living Room and Bedroom are to the right. Beyond that is another Terrace. Vegetation and landscaping is missing. Dirt in front of the South Elevation appears to a work in progress. Some blocks in the walls in front of the Living Room are missing. 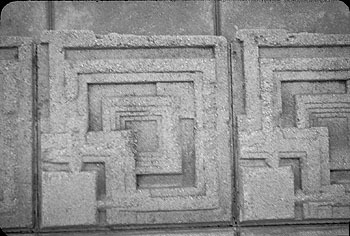 Most likely photographed during one of the renovations between 1940 to 1968. Stamped on face: "8." Verso: "Processed by Color Photo, Inc. Ektachrome Transparency." Not dated. Title: 3) Charles Ennis Residence, Los Angeles Circa 1940s-50s (1923 - S.217). Description: Viewed from the South. The Dining Room is in the center, with its large art-glass windows. The Living Room is to the right. Vegetation and landscaping is missing. Dirt in front of the South Elevation appears to a work in progress. Most likely photographed during one of the renovations between 1940 to 1968. Stamped on face: "1." Verso: "Processed by Color Photo, Inc. Ektachrome Transparency." Not dated. Title: 4) Charles Ennis Residence, Los Angeles Circa 1940s-50s (1923 - S.217). Description: Viewed from the Southeast. The Dining Room is to the left, with its large window. Below it a set of doors open out to a small separate terrace that protrudes the furthest South. Built-in planters are to the right of the small Terrace. The Living Room is to the right. Curtains can be seen in the windows between the Dining and Living Rooms. Vegetation and landscaping is missing. Dirt in front of the South Elevation appears to a work in progress. Most likely photographed during one of the renovations between 1940 to 1968. Stamped on face: "2." Verso: "Processed by Color Photo, Inc. Ektachrome Transparency." Not dated. Title: 5) Charles Ennis Residence, Los Angeles Circa 1940s-50s (1923 - S.217). Description: Viewed from the Southeast. One of the many Terraces is in the foreground. The Master Bedroom, separated from the rest of the house by a Loggia, is to the right. 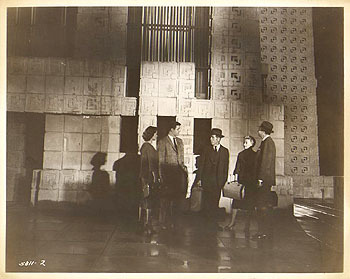 Most likely photographed during one of the renovations between 1940 to 1968. Stamped on face: "3." Verso: "Processed by Color Photo, Inc. Ektachrome Transparency." Not dated. Title: 6) Charles Ennis Residence, Los Angeles Circa 1940s-50s (1923 - S.217). Description: Viewed from the East. Two Terraces are seen on the left. The Master Bedroom, separated from the rest of the house by a Loggia, is to the right. A door leads out to the Terrace in the foreground to the right. The dirt to the right looks like it is a work in progress, construction material is scattered around the landscape. Most likely photographed during one of the renovations between 1940 to 1968. Stamped on face: "1." "002.967.07." Hand written: "G. L. Goldstein." Verso: "Processed by Color Photo, Inc. Ektachrome Transparency." Not dated. Title: 7) Charles Ennis Residence, Los Angeles Circa 1940s-50s (1923 - S.217). Description: Viewed from the East. The Master Bedroom and Terrace are in the foreground. The trees on the right are 20-30 year old fir tree. "Wright In Hollywood" Sweeney, 1994, p.88, show a photograph circa 1924-25, of that same view under construction. There are no trees in that spot. Most likely photographed during one of the renovations between 1940 to 1968. Stamped on face: "4." Verso: "Processed by Color Photo, Inc. Ektachrome Transparency." Not dated. Title: 8) Charles Ennis Residence, Los Angeles Circa 1940s-50s (1923 - S.217). Description: Viewed from the Northeast. The Master Bedroom is on the left. The Bath is enclosed in the three tiered walls. Most likely photographed during one of the renovations between 1940 to 1968. Stamped on face: "9." Verso: "Processed by Color Photo, Inc. Ektachrome Transparency." Not dated. Title: 9) Charles Ennis Residence, Los Angeles Circa 1940s-50s (1923 - S.217). Description: Viewed from the Northeast. The Master Bedroom is on the left. The Bath is enclosed in the three tiered walls. Most likely photographed during one of the renovations between 1940 to 1968. Stamped on face: "5." Hand written: "G. L. Goldstein." Verso: "Processed by Color Photo, Inc. Ektachrome Transparency." Not dated. Title: 10) Charles Ennis Residence, Los Angeles Circa 1940s-50s (1923 - S.217). 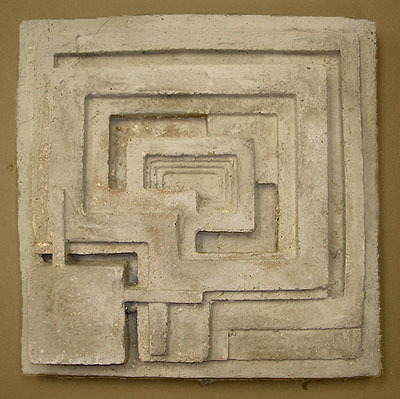 Description: Detail of Textile Block design. Most likely photographed during one of the renovations between 1940 to 1968. Stamped on face: "8." Verso: "Processed by Color Photo, Inc. Ektachrome Transparency." Not dated. Title: Ennis Residence (1923 - S.217). 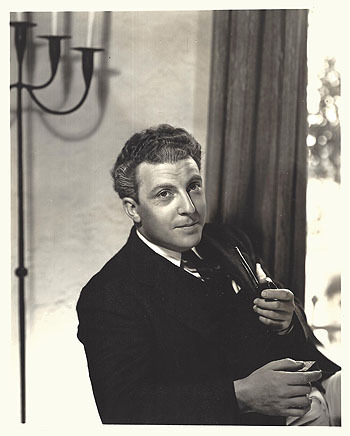 Description: John Nesbitt circa 1945. Newbit, (August 23, 1910 � August 10, 1960) was an actor, narrator, announcer, film producer and screenwriter Nesbitt was best known as the narrator of the MGM series Passing Parade. He was in Victoria, British Columbia. The Passing Parade, was first broadcast in 1937 and ended in 1949. He also was the host of the program So the Story Goes, which was syndicated in 1945-1946. He has two stars on the Hollywood Walk of Fame. In 1940, Nesbitt commissioned Wright to design a home in Carmel, California, which Wright named "Sea Garden." 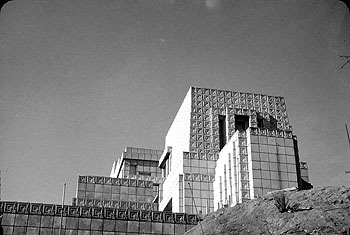 Pfeiffer describes it as "one of the most lavish, most elegant houses he created during the last thirty years of his life" Treasures of Taliesin, 1985. Elaborate plans were drawn up for the 5,000 square foot ocean front home, but they were never executed. 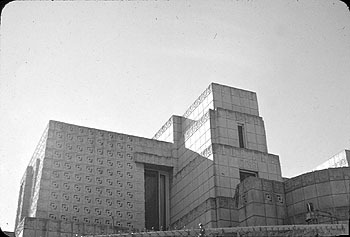 Nesbitt purchased the Ennis House and then commissioned Wright to remodel it in 1941. Acquired from the Hal Roach Studios, Hollywood, California. Title: Interior of the Ennis-Brown House. #5811-2. Description: Caption on back: �House on Haunted Hill, A William Castle-Robb White Production for Allied Artists, stars Vincent Price, Carol Ohmart, Richard Long and Alan Marshal with Carolyn Craig and Elisha Cook in supporting roles. It was produced and directed by William Castle from an original screenplay by Robb White. Pictured here are, left to right: Carolyn Craig, Richard Long, Elisha Cook, Julie Mitchem and Alan Marshal.� Stamped on the back �Manbeck Pictures Corp. 3621 Wakonda Drive, Des Moines, Iowa, 50321-2132 U.S.A.� The House on Haunted Hill was filmed in 1958 and released on February 17, 1959. This photograph is from the collection of Manbeck Pictures in Des Moines, Iowa. Mr. Manbeck collected 16mm movies and showed them in his garage as a teenager in the 1930's. He also collected movie posters and other advertising material that went with the films with the hopes of someday opening a movie museum. He retired in the early sixties as TV took over. He was still a source for rare 16mm prints up until the 1990's. Title: Charles Ennis Residence, Los Angeles, 1975 (1923 - S.217). Description: 1) Set of Six 35mm Color Kodachrome slides. Viewed from the Northwest. Frank Lloyd Wright designed four textile block homes in Los Angeles. This was his last and largest of the four. When you include the chauffeur�s quarters, the home encompasses approximately 6,200 square feet. The home was constructed of more than 27,000 concrete blocks, all made by hand on site. The main house includes a large Living and Dining Room, Kitchen and three bedrooms. 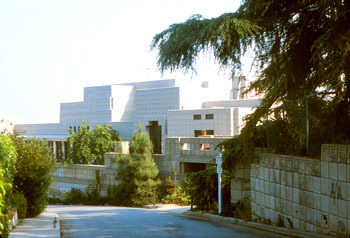 Viewed from the street, the Entrance is in the center, the Kitchen is on the right, Dining and Living Rooms in the center, and Bedrooms to the far left. Stamped on face of sleeve: "28. May 75." 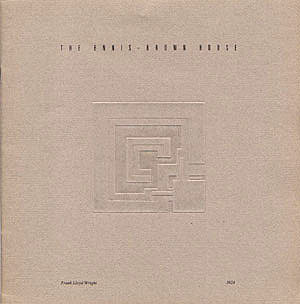 Printed on verso of sleeve: "Kodachrome Transparency. Processed by Kodak." Size: Set of six 35mm slides taken in May, 1975. 10 x 7 High Res digital image. 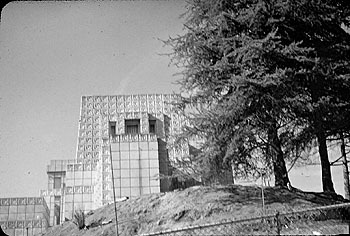 Description: 2) Charles Ennis Residence, Los Angeles, 1975 (1923 - S.217). Set of Six 35mm Color Kodachrome slides. Viewed from the Northwest. The home was constructed of more than 27,000 concrete blocks, all made by hand on site. Viewed from the street, the Bedrooms are on the far left. There is a Loggia between the bedrooms on the far left, and the Bedroom next to the Living Room. The Dining and Living Rooms are in the center, the Kitchen is on the far right. Stamped on face of sleeve: "29. May 75." Printed on verso of sleeve: "Kodachrome Transparency. Processed by Kodak." 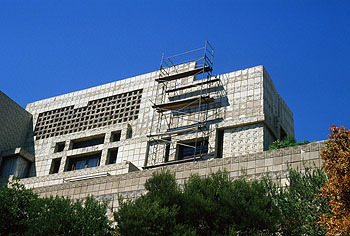 Description: 3) Charles Ennis Residence, Los Angeles, 1975 (1923 - S.217). Set of Six 35mm Color Kodachrome slides. View of the stairway window. Beyond the stairway is the Dining Room. Stamped on face of sleeve: "30. May 75." Printed on verso of sleeve: "Kodachrome Transparency. Processed by Kodak." 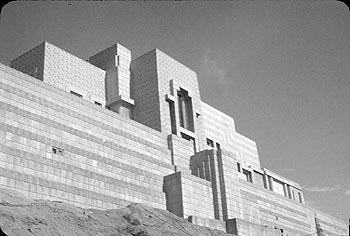 Description: 4) Charles Ennis Residence, Los Angeles, 1975 (1923 - S.217). Set of Six 35mm Color Kodachrome slides. View of the Entrance Gate. 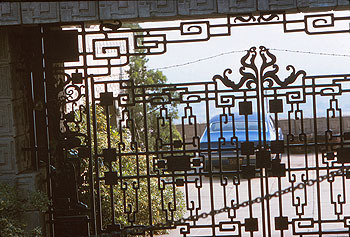 The Entrance to the home is through the gates to the left. The Chauffeur�s quarters and Garage are to the right. Stamped on face of sleeve: "31. May 75." Printed on verso of sleeve: "Kodachrome Transparency. Processed by Kodak." 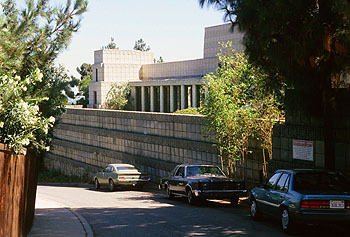 Description: 5) Charles Ennis Residence, Los Angeles, 1975 (1923 - S.217). Set of Six 35mm Color Kodachrome slides. View of the Ennis Residence from the South. The Guest Bedroom is on the left, the Dining Room is in the center, the Living Room is on the right. Stamped on face of sleeve: "32. May 75." Printed on verso of sleeve: "Kodachrome Transparency. Processed by Kodak." 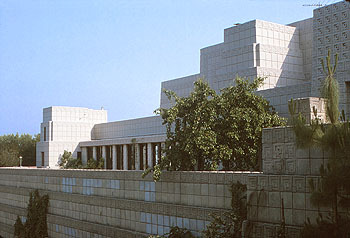 Description: 6) Charles Ennis Residence, Los Angeles, 1975 (1923 - S.217). Set of Six 35mm Color Kodachrome slides. View of the Ennis Residence from the South the back of the house (South elevation). The Chauffeur�s quarters and Garage are to the far left behind the trees. The Guest Bedroom is on the left. The Dining Room with the tall window is to the right of the Guest Bedroom. The Living Room and Bedroom are to the right, and the Master Bedroom is on the far right. Stamped on face of sleeve: "33. May 75." Printed on verso of sleeve: "Kodachrome Transparency. Processed by Kodak." Title: Frank Lloyd Wright, Ennis-Brown House. Description: The Ennis-Brown House is the magnificent creation of world-Famous architect Frank Lloyd Wright. It is one of the most outstanding residential structures existing in the United States. 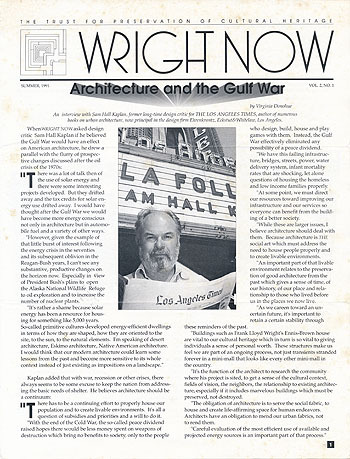 In Architectural Digest (October, 1979) Thomas Heinz states: "The residence is one of the most unusual of Wright�s California designs. In it, he combines elements from his past work with a new vocabulary created specifically for the sun-drenched, slightly rugged topography of Southern California. 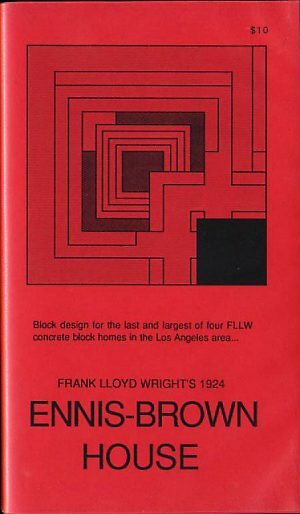 Descriptive brochure concerning the Ennis-Brown House. Includes two photographs by Julius Shulman. Also includes loose 8.4 x 9 single sided sheet on tour information. Gift from Kathryn Smith. 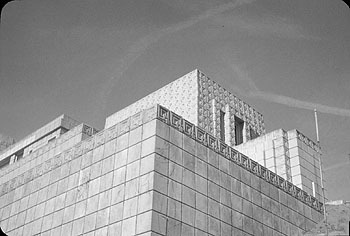 Title: Ennis House Concrete Block Prop. 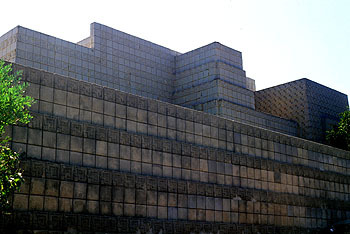 Title: Ennis House Concrete Block Prop 1982. 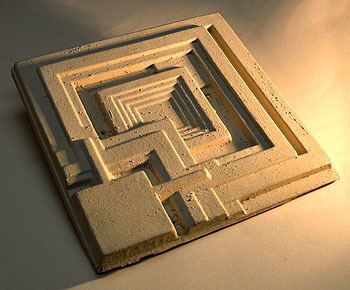 Description: Molded plastic reproduction of the Wright designed concrete block used in Deckard�s Apartment in the Movie "Blade Runner". 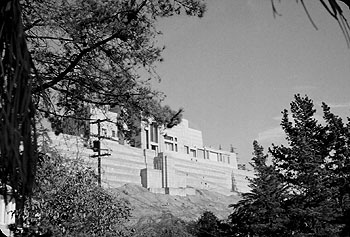 The Ennis Residence was designed by Frank Lloyd Wright in 1923. 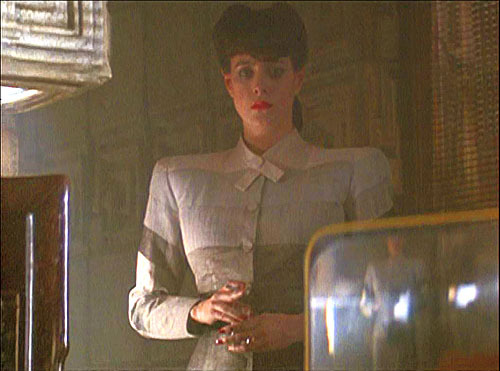 Blade runner was produced in 1982. It depicts Los Angeles in 2019. It is a tribute to the timelessness of Wright�s designs, that a design from 1923 could characterize 2019. 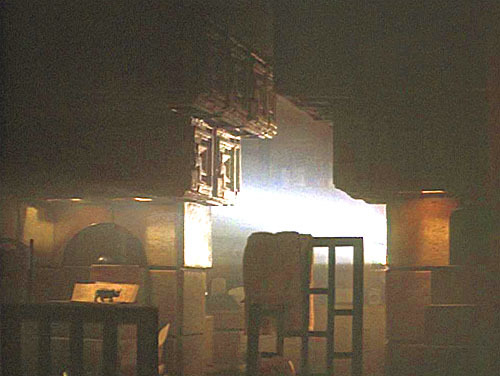 Set decoration used to create Deckard�s apartment. 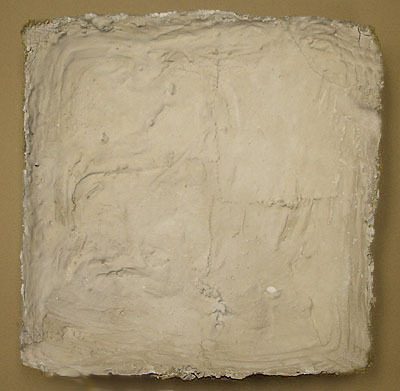 Made of molded plastic or acrylic, painted and textured. Backing includes adhesive and Styrofoam. There are three screw holes where prop was held in place. 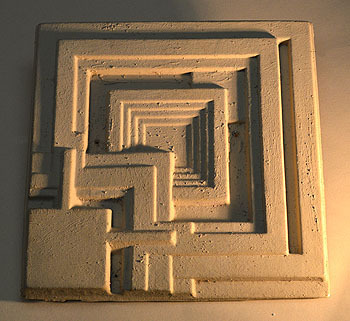 Acquired from a collector in West Hollywood: "Original set prop of Frank Lloyd Wright textile block used for a scene in �Bladerunner� - removed from the Ennis House around 2010 prior to its sale to a private owner." "Early in the 21st Century, the Tyrell Corporation advanced Robot evolution into the NEXUS phase -- a being virtually identical to a human -- known as a replicant. The Nexus 6 Replicants were superior in strength and agility, and at least equal in intelligence, to the genetic engineers who created them. 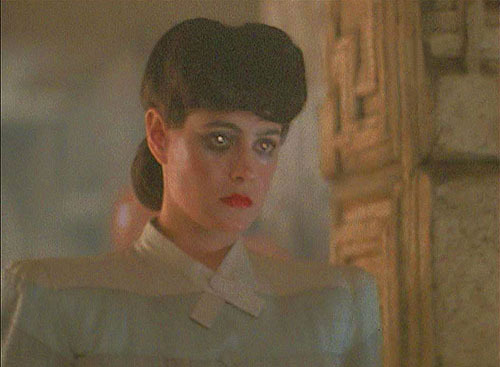 Replicants were used Off-world as slave labor, in the hazardous exploration and colonization of other planets. After a bloody mutiny by a Nexus 6 combat team in an Off-world colony, Replicants were declared illegal on earth -- under penalty of death. 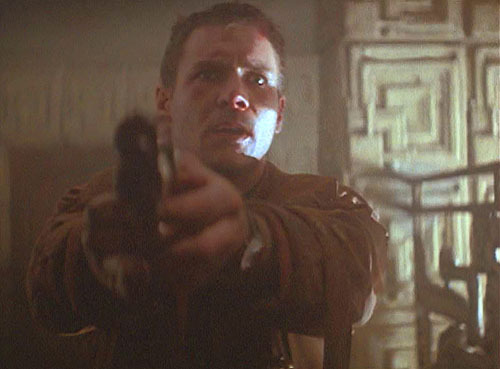 Special police squads -- Blade Runner Units -- had orders to shoot to kill, upon detection, any trespassing Replicants. This was not called execution. It was called retirement. Los Angeles. November, 2019." Blade Runner. 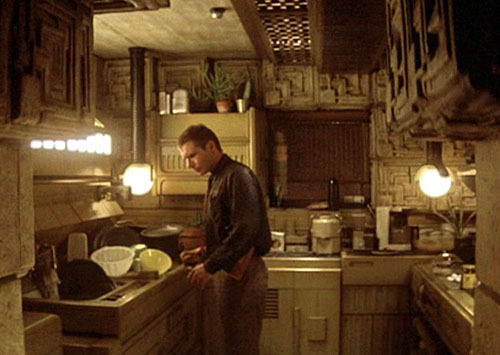 Deckard�s Apartment Interior. 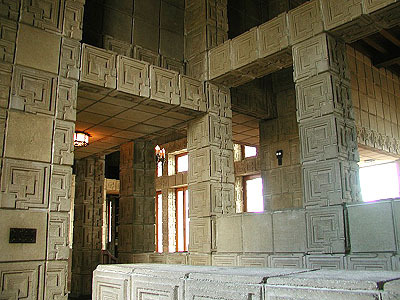 The interior of Deckard's apartment was created utilizing a design Frank Lloyd Wright created in 1923 for the Ennis House. 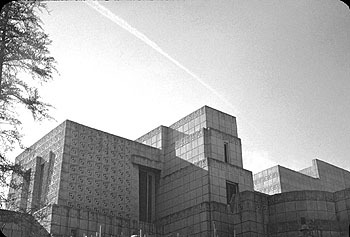 The Ennis House was designed of textile concrete blocks. 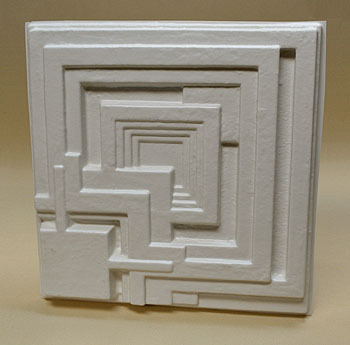 Molded plastic reproduction of the Wright designed concrete block were used in Deckard�s Apartment. 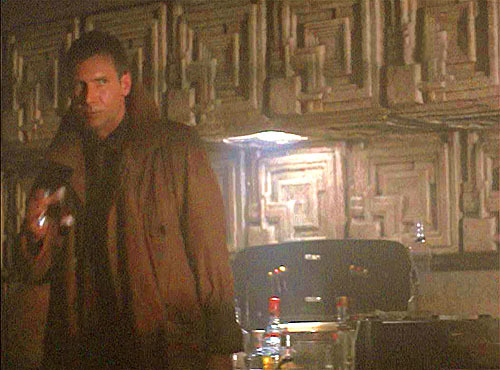 Blade runner was produced in 1982. It depicts Los Angeles in 2019. It is a tribute to the timelessness of Wright�s designs, that a design from 1923 could characterize 2019. 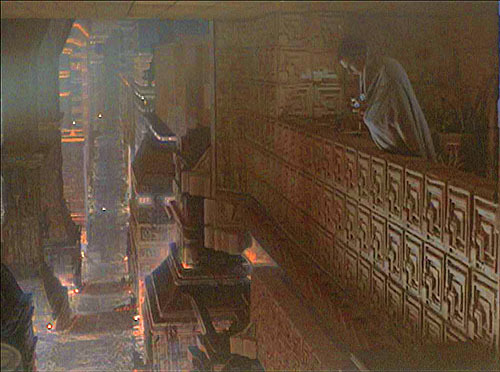 Note - We lightened and enhanced screen captures of the interior of Deckard's Apartment. 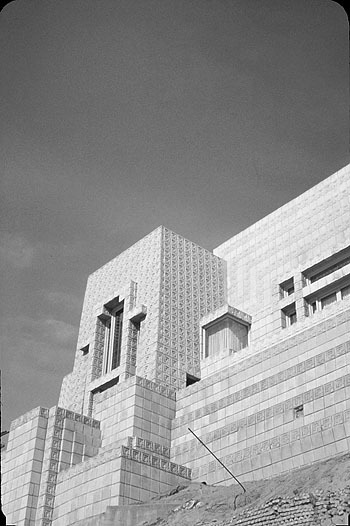 Title: Charles Ennis Residence, Los Angeles(1923 - S.217), 1994. Description: Set of 9 photographs from a trip to Los Angeles, 1994. 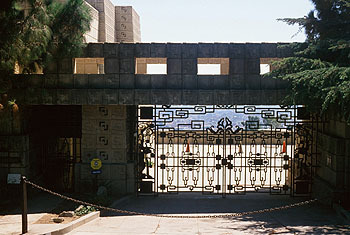 Frank Lloyd Wright designed four textile block homes in Los Angeles. This was his last and largest of the four. When you include the chauffeur�s quarters, the home encompasses approximately 6,200 square feet. The home was constructed of more than 27,000 concrete blocks, all made by hand on site. The main house includes a large Living and Dining Room, Kitchen and three bedrooms. Viewed from the South, the back of the house (South elevation), the tall window in the Dining Room is visible on the left. Photographed by Douglas M. Steiner. Size: 35mm color slide and 12 x 8" high res color digital image. Description: Set of 9 photographs from a trip to Los Angeles, 1994. 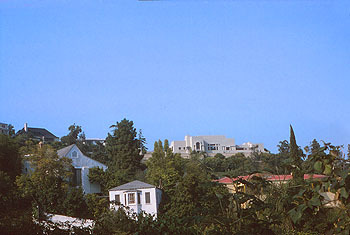 Frank Lloyd Wright designed four textile block homes in Los Angeles. This was his last and largest of the four. When you include the chauffeur�s quarters, the home encompasses approximately 6,200 square feet. The home was constructed of more than 27,000 concrete blocks, all made by hand on site. The main house includes a large Living and Dining Room, Kitchen and three bedrooms. View of the North elevation from the Northwest. The Master Bedroom is is on the far left. The long Loggia, with doors on either side, separate the master bedroom from the rest of the house. The Entrance to the house is to the far right, out of the picture. Photographed by Douglas M. Steiner. Description: Set of 9 photographs from a trip to Los Angeles, 1994. 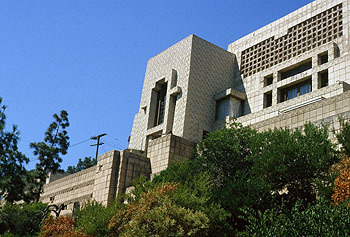 Frank Lloyd Wright designed four textile block homes in Los Angeles. This was his last and largest of the four. When you include the chauffeur�s quarters, the home encompasses approximately 6,200 square feet. The home was constructed of more than 27,000 concrete blocks, all made by hand on site. The main house includes a large Living and Dining Room, Kitchen and three bedrooms. View of the North elevation from the Northeast. Looking up at the main level, the Loggia is on the left. The wall is blocking the view of the row of doors that lead into the Loggia. The Living Room is in the center, the Entrance can be seen on the right. Photographed by Douglas M. Steiner. Description: Set of 9 photographs from a trip to Los Angeles, 1994. 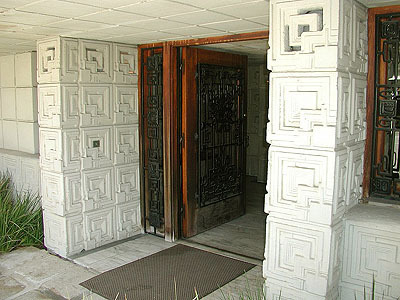 Frank Lloyd Wright designed four textile block homes in Los Angeles. This was his last and largest of the four. When you include the chauffeur�s quarters, the home encompasses approximately 6,200 square feet. The home was constructed of more than 27,000 concrete blocks, all made by hand on site. The main house includes a large Living and Dining Room, Kitchen and three bedrooms. View of the main entrance into the Courtyard. Gate is a bit Un-Wright. Main home is on the left. Garage and Chauffeur�s quarters are to the right. Photographed by Douglas M. Steiner. Description: Set of 9 photographs from a trip to Los Angeles, 1994. Frank Lloyd Wright designed four textile block homes in Los Angeles. This was his last and largest of the four. When you include the chauffeur�s quarters, the home encompasses approximately 6,200 square feet. The home was constructed of more than 27,000 concrete blocks, all made by hand on site. The main house includes a large Living and Dining Room, Kitchen and three bedrooms. 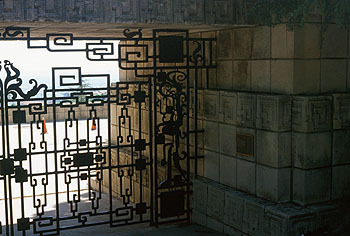 View of gate, which appears to be a bit Un-Wright. Photographed by Douglas M. Steiner. Description: Set of 9 photographs from a trip to Los Angeles, 1994. Frank Lloyd Wright designed four textile block homes in Los Angeles. This was his last and largest of the four. When you include the chauffeur�s quarters, the home encompasses approximately 6,200 square feet. The home was constructed of more than 27,000 concrete blocks, all made by hand on site. The main house includes a large Living and Dining Room, Kitchen and three bedrooms. 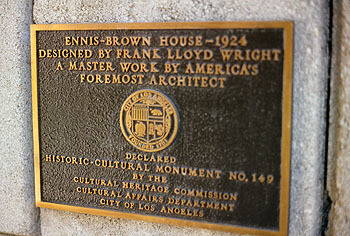 Detail of the plaque near the entrance: "Ennis-Brown House - 1924. Designed by Frank Lloyd Wright. 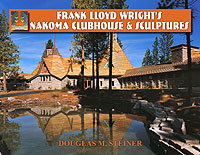 A Master Work by American�s Foremost Architect. Declared Historic-Cultural Monument No. 149. By The Cultural; Heritage Commission, Cultural Affairs Department, City of Los Angeles." Photographed by Douglas M. Steiner. Description: Set of 9 photographs from a trip to Los Angeles, 1994. 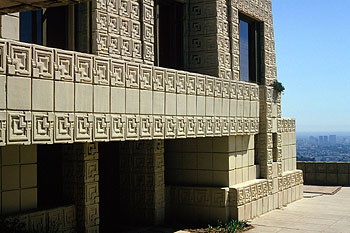 Frank Lloyd Wright designed four textile block homes in Los Angeles. This was his last and largest of the four. When you include the chauffeur�s quarters, the home encompasses approximately 6,200 square feet. The home was constructed of more than 27,000 concrete blocks, all made by hand on site. The main house includes a large Living and Dining Room, Kitchen and three bedrooms. View of the West elevation from the Northwest. The Kitchen is on the left, the Guest Bedroom is on the right. Photographed by Douglas M. Steiner. Description: Set of 9 photographs from a trip to Los Angeles, 1994. 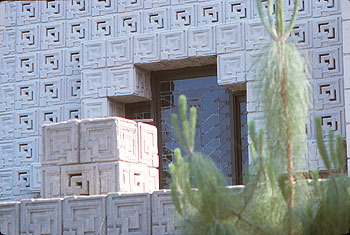 Frank Lloyd Wright designed four textile block homes in Los Angeles. This was his last and largest of the four. When you include the chauffeur�s quarters, the home encompasses approximately 6,200 square feet. The home was constructed of more than 27,000 concrete blocks, all made by hand on site. The main house includes a large Living and Dining Room, Kitchen and three bedrooms. View of the South elevation (back), from the Southeast. The Dining Room is on the left, the Living Room is on the right. The smaller mitered glass corner window is one of the corners of the Dining Room. A large section of the exterior Living Room wall is being replaced on the upper right. Photographed by Douglas M. Steiner. Description: Set of 9 photographs from a trip to Los Angeles, 1994. Frank Lloyd Wright designed four textile block homes in Los Angeles. This was his last and largest of the four. When you include the chauffeur�s quarters, the home encompasses approximately 6,200 square feet. The home was constructed of more than 27,000 concrete blocks, all made by hand on site. The main house includes a large Living and Dining Room, Kitchen and three bedrooms. View of the South elevation (back), from the Southeast. The Dining Room is on the far left, the Living Room is on the left. One of the Bedrooms is on the right. The smaller mitered glass corner window on the far lower left is one of the corners of the Dining Room. A large section of the exterior Living Room wall is being replaced on the upper right. Photographed by Douglas M. Steiner. 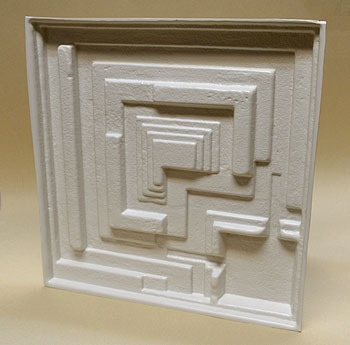 Title: Ennis House Concrete Block Mold 2013. Description: Created for a Blade Runner short film based on the book "Do Androids Dream Of Electric Sheep." It is due for release in 2016. 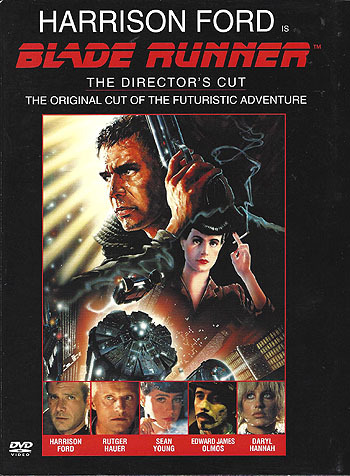 The original full length Blade Runner movie was created in 1982 and depicts Los Angeles in 2019. 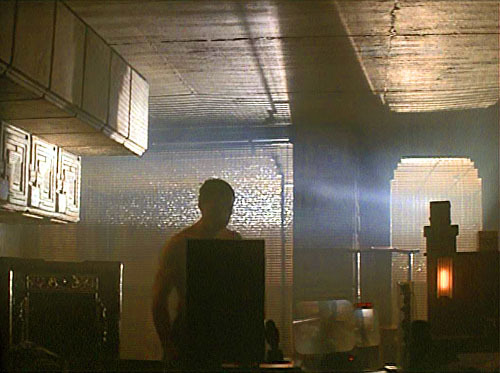 Produced by Michael Deeley, Directed by Ridley Scott, the 1982 Ennis block was used in Deckard�s apartment. 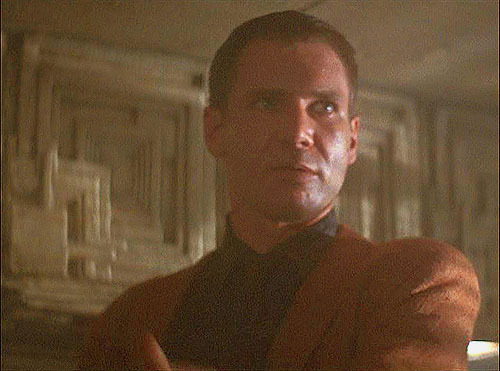 Rick Deckard was played by Harrison Ford. It is a tribute to the timelessness of Wright�s designs, that a design from 1923 could characterize 2019. 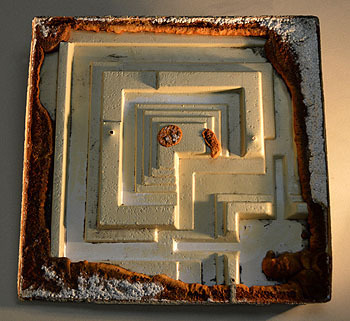 30 molds were created in 2013, using an ABS plastic. They created a few extra, and we were able to acquire one of them. 1:1 Replica. 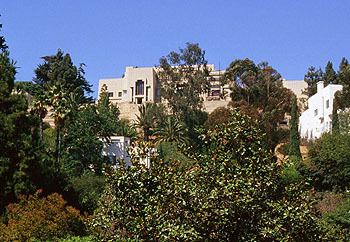 2) Living At The Ennis-Brown House. 3) The Wright Year 1990-1991. 5) Famed Photographer Pictures Steps and Stairways. 6) Docent Volunteer. Includes three photographs. Gift from Kathryn Smith. Description: 1) Architecture and the Gulf War. 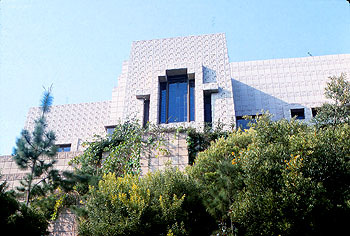 2) Major Motion picture uses Ennis Brown House. 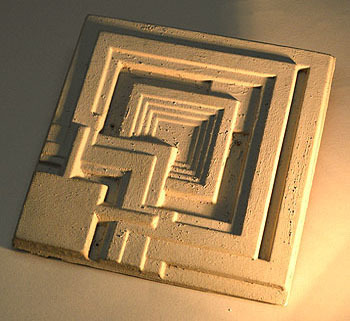 3) Organic Architecture is Happening "Wright Now". 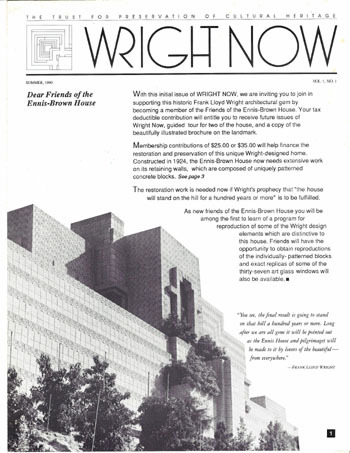 5) Ennis-Brown House Needs the Wright Friends. 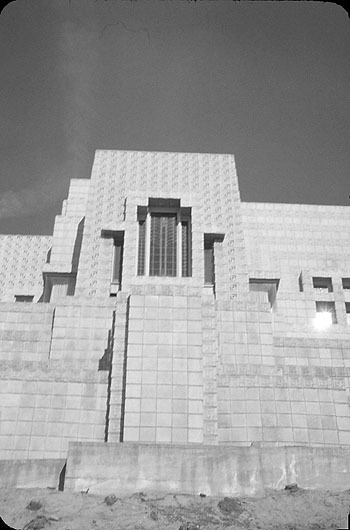 6) Stunning Ennis-Brown House photos in new FLLW Volume. Includes 5 photographs and illustrations. Gift from Kathryn Smith.